Earlier this week the Poker players Alliance released their 2010 Congressional Ratings Guide, grading each member of Congress’s support for poker. In their 2008 ratings the Poker players Alliance 258 members of Congress received a D or F grade. Compare this to the 2010 number of 194, and it becomes apparent how far poker has come in just two short years. 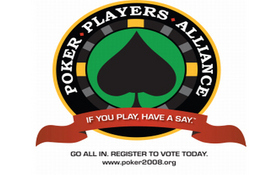 Poker players can access the Congressional Ratings Guide on the PPA website, www.ThePPA.org, and are able to send E-Mails directly to their members’ of Congress through the searchable Ratings Guide on the site. Another added wrinkle to the 2010 ratings is the ability to sift through any correspondence sent by their member of Congress to their constituents directly related to poker: E-Mails, Letters, Twitter updates, you name it. With poker legislation making its way to Capitol Hill this year marks the first time that the PPA was able to rely specifically on the voting records, and co-sponsorship of poker-related legislation, of the members of Congress, and not just rely on the rhetoric coming from their staff or office. This is one of the best tools for poker players to utilize as we fight for the right to play poker, and to have a legalized and regulated industry, especially online poker. This entry was posted on Friday, September 17th, 2010 at 6:17 pm and is filed under Poker Industry News. You can follow any responses to this entry through the RSS 2.0 feed. You can leave a response, or trackback from your own site.